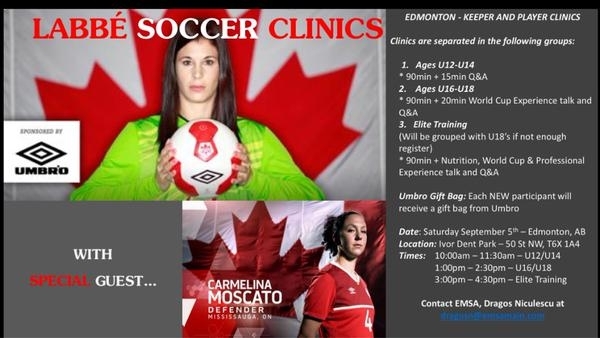 I am SO EXCITED to announce my next camp in Edmonton will feature one of Canada’s top defenders, Carmelina Moscato as my coaching partner! We will be running a player and keeper camp, for all ages on Saturday, September 5, 2015! No restrictions! This is sure to be an exciting day, filled with lots of energy, information, fun and new learnings! We will do a joined warm-up including some ball skills and technique work, followed by Carmelina working with the players, and myself working with the keepers, and we will come together at the end for some exciting games and competitions! If you want more information, or want to secure a spot in this camp contact Dragos Niculescu- dragosn@emsamain.com but do it fast before spots fill up!